Having announced the Norma UK Cup earlier this week – which will run as part of the Britsport Series in 2006 – we can now add some more detail, having caught up with Nigel Greensall at the NEC on Thursday. He, Jonathan Coleman and Iain Dockerill are the UK importers for the French prototypes. Norma has already built a 400 bhp, BMW-engined version of its car – which runs in French hillclimbs – “but we’re thinking of bringing one to the UK. Apart from a Hewland gearbox, and the engine change, it’s exactly the same as this chassis (pictured with the lovely Sophie Brugmans behind the wheel yesterday. Sophie’s nickname is “Bunny” but we’re not supposed to say that). 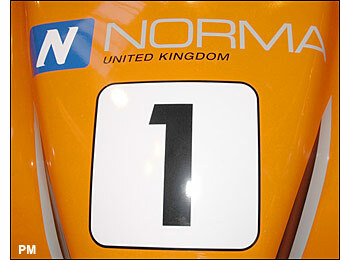 Norma still has plans to move up to the LMP2 class in due course, perhaps by 2007. 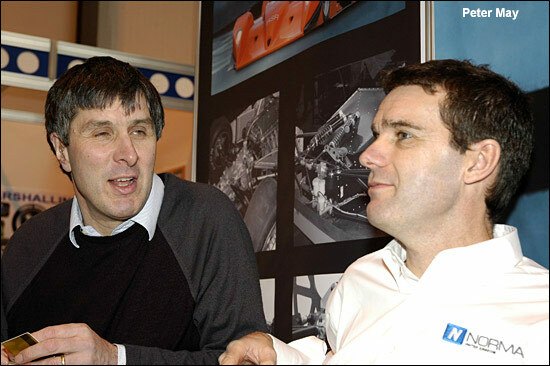 An interesting visitor to the Norma stand was John Hartshorne (below, left, with Nigel Greensall), he of yellow and black (LMES and Le Mans) Racesports TVR fame. Dennis Leech looks as though he won’t be running John’s TVR this year, but perhaps the guys at Chad Racing will be?